South Industries was selected to construct the dome-shaped planetarium located on the Orange County, CA campus. 2018 brought great change to the campus of Orange Coast College as South Industries built a dome for the new Planetarium. In 1958 Orange Coast College, located in Coast Mesa, CA built a Planetarium seating 35 people. 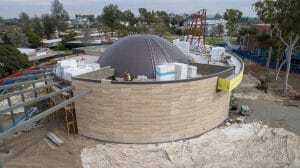 The old building was torn down and South Industries built a dome for the new Planetarium. Located within the dome will be an auditorium of 129 seats. This space will be used for college lectures as well as to display planetarium shows for students and the community. The dome is 86 feet wide and has nearly 6,000 square feet of interior space. The dome makes up about half of the square footage of the newly built Planetarium. The remaining areas of the building are nearing completion and plans are to have it open Winter of 2019. This new Planetarium is exciting for the students at OCC and for the surrounding community.